"Ugh. Fleas!" Can you relate to this statement? If you've ever dealt with a flea infestation, we're sure you can. Fleas are a frustrating pest problem to have. It can cause rational people to do some pretty irrational things. But, before you do something you'll regret, take a quick look through this guide for some insight on how these pests behave, and what works to effectively get rid of them. If you have an infestation in your home, the first thing you need to ask is, "How did those fleas get in?" Homeowners with cats or dogs probably don't have to scratch the heads for very long. There is a pretty good chance that Fluffy or Spike had something to do with those fleas getting in. Fleas don't hop into our homes, they ride in on furry animals. As a result, pet owners are at a much higher risk for flea infestation than those who do not have pets, especially if they allow their pets to come and go as they please. But dogs and cats aren't the only furry creatures that can bring fleas into your home. And dealing with flea infestations that are started by pets is completely different than infestations caused by wildlife. There are two levels of threat as far as wildlife is concerned. When wild animals come into your yard, they can drop flea eggs as they explore your property. This creates the conditions for pets to pick eggs up when they go outside. Making sure your pets have veterinarian-prescribed flea products is a good first step to protecting your pets, and yourself. Some animals are not content to stop at your exterior walls. They will chew their way into your home and explore every inch. As they do, they can leave flea eggs in every room they explore. Rats and mice are best known for this. If you've been dealing with a rat problem, it isn't surprising that you're dealing with a flea problem. It also wouldn't be surprising if you've been dealing with a lice, mite, or tick problem, either. The solution for a flea infestation caused by rodents begins with a sealing of all entry points rodents are using to get into your home. Then all the rodents must be captured and removed. It is only then that you will be able to address the flea issue. Both of these are best accomplished by hiring a professional. An educated pest technician will follow methods and guidelines established by experts in the industry and, through a process of inspection, monitoring, and trapping, be able to assure you that all of those rodents are gone. The more you actively protect your yard from wildlife, the more protected your home will be from flea infestations. It is also a good idea to establish a fenced-in area for your pets that is resistant to wildlife. There are many conditions that can lure rodents and other wildlife into your yard such as leaf piles, firewood, lawn clutter, weeds, open trash cans, and more. Managing these can help you control wildlife and the fleas they carry. But, there are many things that only a professional pest control technician is equipped to do. Pest management is a complex process that requires education, experience, and the right equipment to get the job done effectively. If you're fighting fleas, it is easy to throw a lot of time, money, and energy at the problem, and continue to have flea infestations. Before you do, consider giving Big Blue a call. 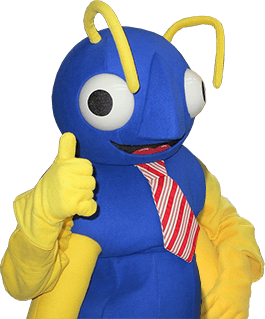 The professionals here at Big Blue Bug Solutions are educated in the habits and habitats of pests and trained in the most advanced pest control methods in the industry. They'll make sure the entire problem is corrected, and guide you in ways to prevent future infestations from occurring. Life in Maine is complicated enough without having to unravel a complex pest control problem. If you live in South Portland or Southern Maine, reach out to Big Blue Bug Solutions today and get the help you need to make your home a flea-free zone. Permanently.